Remember when Logan Thomas was a sure-fire first-round NFL draft pick? Thomas had a banner year as a sophomore at Virginia Tech, when he threw for 3,013 yards, accounted for 30 touchdowns and led the Hokies to a BCS bowl. Hard as it is to believe, Thomas’ numbers two years later, as a senior, are not that much better than the much-maligned David Watford at UVa. Actually, Thomas has pushed ahead of his upstate counterpart the past couple of weeks, or maybe it’s as much that Watford has taken a big step back after a decent run midseason. Thomas is 70th in the NCAA in passer efficiency and 75th in the ESPN Total QBR Rating, completing 58.3 percent of his passes for 2,632 yards and 15 touchdowns with 12 interceptions. Watford is the 98th rated quarterback in the passer efficiency numbers and 104th in the ESPN Total QBR, completing 57.2 percent of his passes for 2,080 yards and eight touchdowns and 15 interceptions. The key difference between the two is in touchdown production. The similarities are astounding. 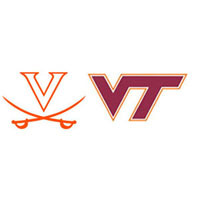 Both are playing for new offensive coordinators (Steve Fairchild at UVa., Scot Loeffler at Virginia Tech), both head offenses that lack production from their running games (UVa. is ninth in the ACC at 160.9 yards per game, Tech is 12th at 117.1 yards per game), and both are expected to add some punch on the ground (Thomas has run for 320 yards, Watford has 171 rushing yards). Both have been under fire from their teams’ respective fan bases, Thomas without much of a viable option behind him as a senior three-year starter, Watford, a redshirt sophomore, with a very viable option as his doppelganger, prized recruit Greyson Lambert. Both have the full support of their head coach heading into the regular-season finale on Saturday in Charlottesville. Watford continues to get the ball from UVa. coach Mike London despite his recent struggles, completing just 44.4 percent of his passes for 365 yards and a touchdown and six interceptions in Virginia’s losses to Clemson (59-10, Nov. 2), North Carolina (45-14, Nov. 9) and Miami (45-26, Nov. 23). London did say Monday in his weekly press conference that Lambert will get some snaps after the redshirt freshman completed 13 of his 19 pass attempts for 134 yards in fourth-quarter mop-up duty in Miami last Saturday. But Watford is still a clear #1 to London. “As I said one point in the game last Saturday, there were about six, seven true freshmen on the field playing, and it’s about the development of them, as well. So we will find the times and opportunities to allow Greyson to get in the game and play, but David needs to continue to improve and in the area that he needs to improve in, so we have one game left, and we’ll continue that path,” London said. London didn’t say how he would divide the playing time between Watford and Lambert, which will make it tough for Virginia Tech to prepare, given the different strengths that they bring to the table – Watford and his sub-4.5 40 putting pressure on defenses with his feet as much as his arm, Lambert being more of a prototypical pocket passer.